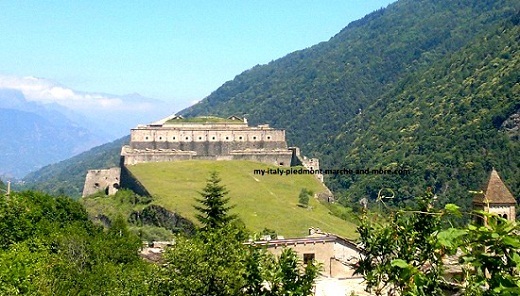 The Val di Susa in Piedmont is the place in which the book The Name of the Rose comes to life for me. The Name Of the Rose is one of my favourite books by Umberto Eco made into a film starring Sean Connery. Not the actual one used in the film – the exterior of which was actually a mock up - but this monastery is to all intents and purposes the place that the mock-up was copied from. 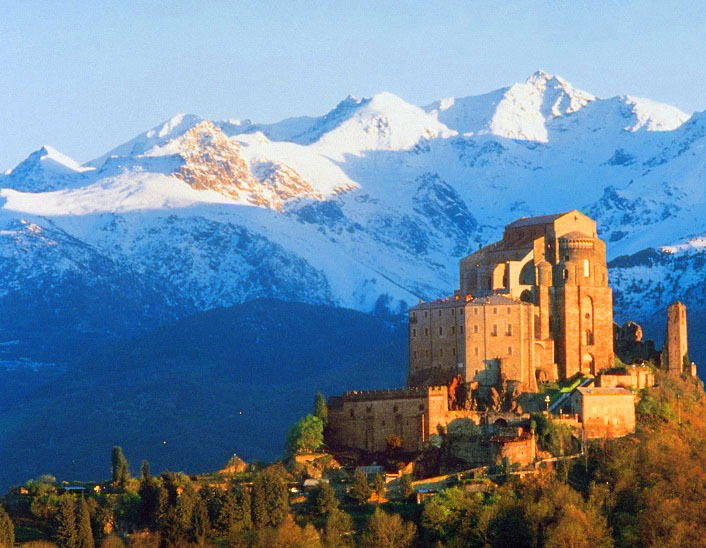 Read more about this Monastery - the Sacra di San Michele here. If you are planning on spending a few days in the area then Chiomonte (more on the town later) is very central to everything - try to stay at the Al Cantoun. The ideal way to tour this area is to follow the steps of those medieval pilgrims heading for Gaul. Start from Turin as they did and head for Rivoli, the first stop on this road and the gateway to the Val di Susa. Rivoli is home to the fabulous Museum of Modern Art, housed in one of the castles belonging to the Savoy Royal Family. Following in the steps of the pilgrims to Gaul visit the twelfth century gothic church of Sant’Antonio, one of the most remarkable medieval gothic churches in the Val di Susa and indeed in Piedmont. The frescoes inside are the work of Jacopo Jaquero – the most famous Piedmont artist of this period. On entering the church it is not difficult to imagine tired pilgrims, returning from France, arriving here to the warm welcome that this church was renowned for. These lakes are the major attractions for those spending the day from Turin and the restaurants along their shores, catering to the high standards of those from Turin, are all of good quality. The lakes both form part of the Lakes of Avigliana National Park and the area is popular with bird watches – I am not much of a bird watcher so can’t really add too much here, other than saying that it is apparently a good place to see the Germani Reali. I have no idea what a Germani Reali is in English or even Italian but an Italian bird watching friend tells me you can see one here if you are interested. Is it worth a trip from abroad to see this bird? Even with the cheap flights to Turin these days I wouldn’t bother but, well, my friend tells me it is and people come from all over to see them. Near Avigliana there is a great agritourism farm and restaurant that is a shrine to local Piedmont gastronomy – unknown to but a few and only serving dinner on Saturday and lunch on Sunday – it is worth finding if you are serious about Italian food and more particularly after authentic Piedmontese cuisine. Click here for details. Next on the Val di Susa/ Piedmont tour must be the city of Susa -the biggest city in the valley but still only a small town and nothing really special. Susa has a few interesting sites – most notable is the eleventh century cathedral of San Giusto, the Roman era city gate in piazza San Giusto and the Roman baths. Last stop on the tour is Chiomonte. I spend a lot of time here because our best friends, Guido and his wife and son, have their weekend house up here. This is a lovely little town on the train line from Turin/Torino. The town is a great place to get away from it all for a long weekend either in winter or summer. In winter there is little better than drinking a glass of red wine in front of a raging fire, and looking out at the snow on the surrounding mountain peaks. In summer it is just as great, a long lunch al fresco washed down with a good glass of the finest red wine from Piedmont and finished with a double espresso before relaxing in the shade of the olive trees. Once the lunch has been digested a walk up one of the surrounding hills is suggested – this way you also get to meet the rest of Chiomonte enjoying their early evening walk. If you need somewhere to stay in Chiomonte try the Al Cantoun. Chiomonte is famous for having the highest vineyards in Piedmont (click for details) . Try get to Chiomonte on the 20th of January for the festa of San Sebastiano, the patron saint of Chiomonte, all the youth of the town dress in period costume and dancing and eating in the main piazza is the order of the day. The focus is “la puenta” a symbol of good luck and around which the ladies of the town dance. The festa is also the culmination of the wines of ice project or Eisweine and the frozen grapes are gathered from the terraces of the Cantina la Maddalena. To end Chiomonte has some lovely old churches worth seeing. The Church of Santa Caterina dates back to the twelfth century and the Church of Santa Maria has some wonderful frescoes. Chiomonte was the birth place of Admiral Andrea Agnes des Geneys – the man who started the navy of the Savoy royals in early 1800. There's the awe-inspiring Fortress of Fenestrelle nearby, which you absolutely must visit. It is commonly know as the Great Wall of Europe and is second only to the famous Great Wall of China in terms of length. It took 120 years to build and covers over a million square meters. 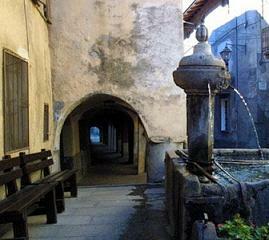 Not far from the fortress is little Usseaux, it is often said to be one of Italy's loveliest villages. You've got to try the local cheese infused with violets - it's called formaggio delle viole and is quite addictive - trouble is you'll never find it anywhere else but here. Don't forget to visit the nearby great ski resorts of Bardonecchia and Sestriere. The scenery is spectacular and there are great walks in summer through the surrounding countryside. Where is the Val di Susa? Return to "A Secret Italy" Index.